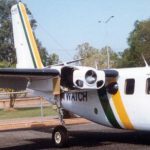 The helicopter 12 was one of six that assisted in the cleanup of Darwin following Cyclone Tracy during “Operation Navy Help” January 1975 while based on HMAS Melbourne. 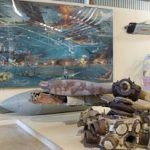 It was damaged during “Kangaroo 89” a major defence exercise and then was repaired at HMAS Coonawarra (Darwin’s Naval Base) for display and subsequently presented to the museum in March 1990 as our first major exhibit. The Navy later returned to refurbish the cockpit and donate the Gazelle turbine engine now on display beside the aircraft. The Navy have replaced all of these helicopters with Sea King helicopters. Society members completed a major rebuild of the Wessex in 2006 to replace the severely corroded external magnesium skin.